The level of customer service and engagement I have experienced at this location is unlike anything I have ever seen. Richard was ressourceful and provided the level of support I needed. 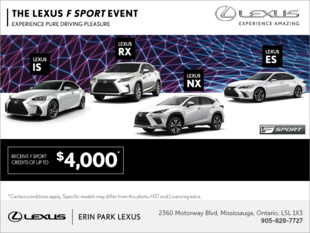 The service team at Erin Park Lexus is the best I have ever seen (other companies & industries take note) ... Anywhere! Under the leadership of Sid Amalsadvala, the team goes above & beyond the call of duty to make the entire experience great. I came to the dealership 8 years ago and have never left since.